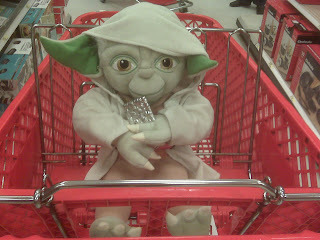 Some last minute shopping at Target with Yoda and his cracker. There was nobody out when the snow started yesterday. There were no foot prints or tire tracks. It made me realize how busy this three lane road in Central Park is on a normal day. It was all empty, white and untouched. I love weather like this. 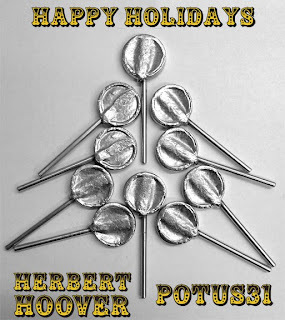 Have a Lolly Jolly Christmas, from Burl Ives and me. 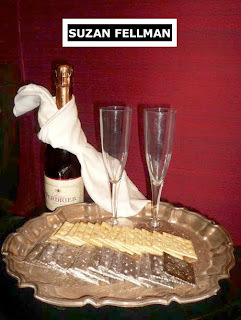 Saltines, wishbones, monkey bones, pretzels, fortune cookies & CHAMPAGNE. 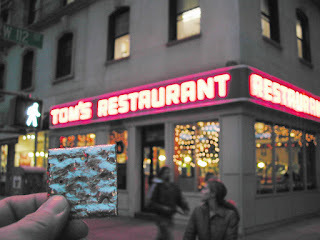 George, Jerry, Elaine, & Kramer are seen regularly eating at Tom's Restaurant on Seinfeld. Here, the place is decorated for the holidays with string lights. 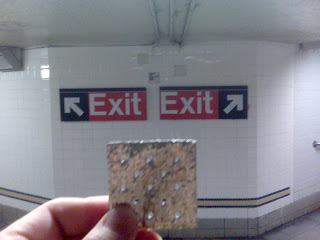 Sartre Cracker "l'enfer, c'est les autres"
Ever get that feeling of being pulled in two directions at once? Jean-Paul Sartre would love this moment. 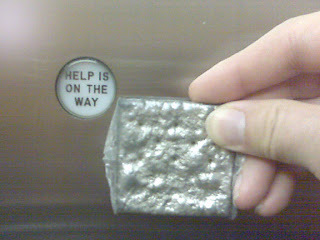 Hell is other people's exit strategy at 23rd Street, NYC. 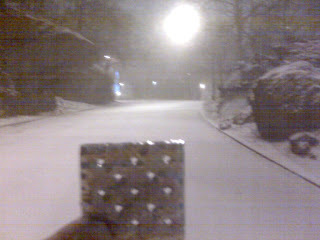 Zebra Cracker. Just got it from the caster. Not polished or anything. It's beautiful in the raw state! 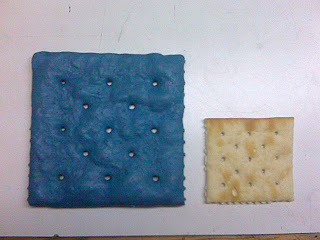 This cracker appears larger than objects that it comes close to. 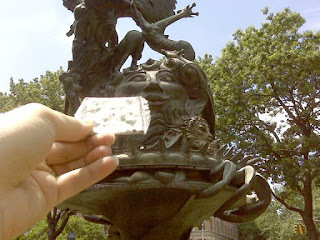 I carved a larger cracker in wax for all of you saltine fans. 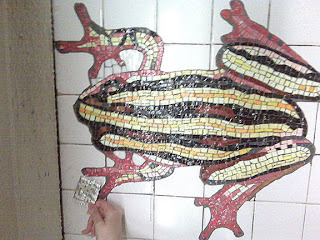 Here's a picture for scale. It's significantly larger. I'm considering making one twice this size as well. 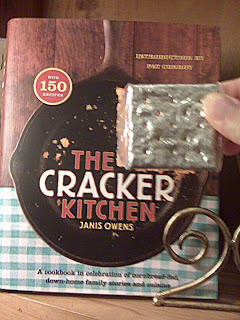 It seems every year Apalachicola has a new book on crackers. We haven't tried any of the recipes yet. 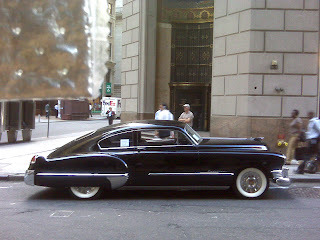 This beautiful car was parked outside of a Wall Street bank. Can you spot the cracker? 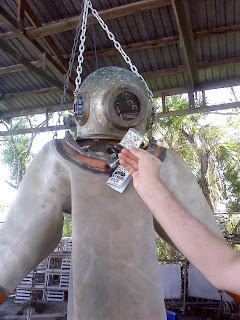 You can buy almost anything Nautical at The Tin Shed in Apalachicola, FL. I got some sea sponges there to take to the nuclear reactor in Canada. I'm creating an exhibit of radiographs of sea creatures to be released later this year. Sign up for the newsletter to stay informed. 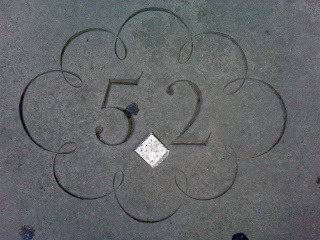 Nice pattern cast in the concrete on West 12th Street, NYC. 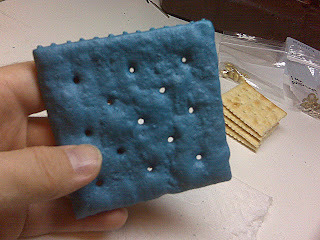 No cracker today. That would be redundant. 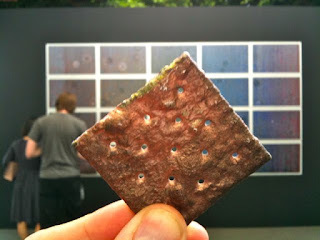 I cast American snacks in pewter. 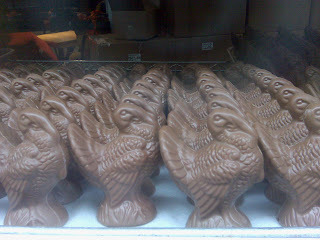 Jacques Torres casts American holidays in chocolate. Maybe one day I'll cast a pewter turkey, but until then, chocolate turkey is always better than aunt Edna's dry white bird. For Patsy's 76th Anniversary, they rolled back the prices to 1933 prices. The line was long, but people were patient. 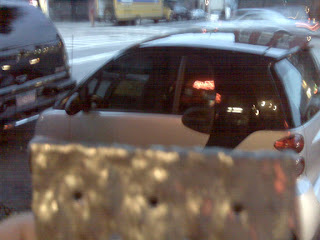 There were several cars from the period parked outside. 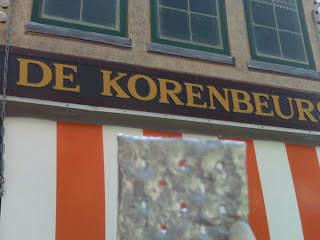 Wifie found her name in a faux Dutch town on a lunch-time stroll. 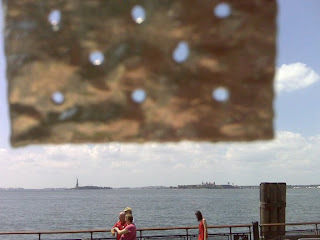 The Statue of Liberty intrigues many people. I'm one of them. I did an oral presentation on Lady Liberty in 5th grade. Long before Google, we either had World Book or Britannica Encyclopedias to do our reports from. My homework (completed in the 70s if you must know) was often misguided by my prized set of 1955 World Book Encyclopedias handed down from my uncle. After a few bad grades for out-dated references, my parents got me the Random House All-In-One Encyclopedia (I still have it). 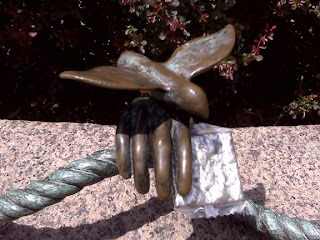 Not as much about the copper crowned French chick in the harbor as World Book, but something. Why did the French give her to us? Only they know. That's her sticking up in the distance. 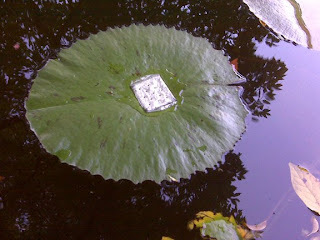 My wife takes a walk out to the water at lunch time and wonders if her arm gets tired holding that torch. Yeah, look close. It's that thing that could be mistaken for a lighthouse. 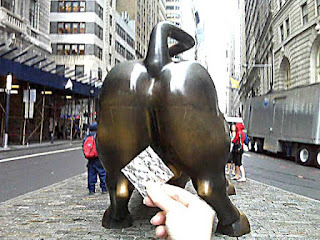 Want a closer view, then take the Staten Island Ferry. 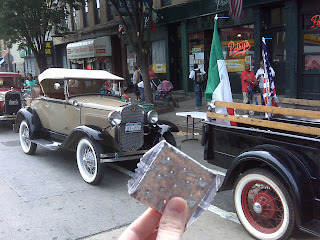 It's a fun ride.
. . . one cracker long . . .
. . . and one cracker wide. 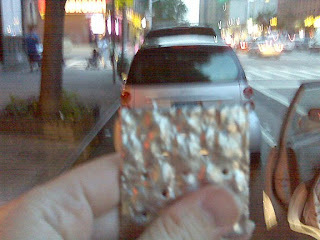 The Smart Car would fit in a cracker box, so if you have a Cracker Box Palace, you'll do fine with it. He's not heavy. He's my brother. Typical New York street signs give mixed signals: Walk that way, one way the other way, no parking today, no parking tomorrow, no parking ever. 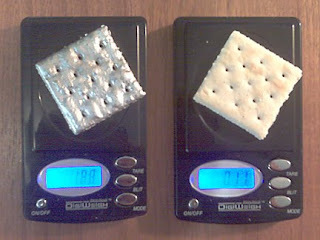 Cracker cousins having a little get-together. 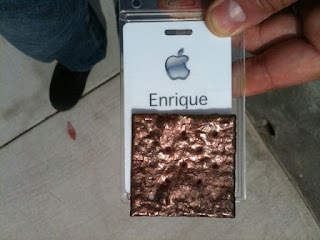 Iron melts at 2800 °F. 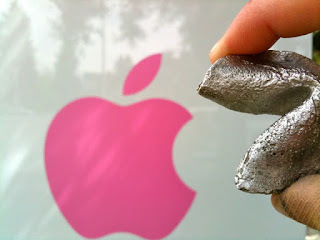 Pewter melts at 450 °F. 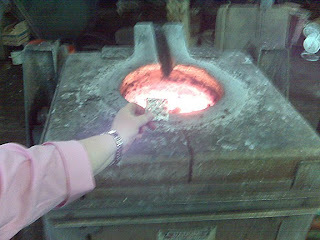 If Momma Donna tossed her cracker into that crucible it would explode like an ice cube in hot tea. 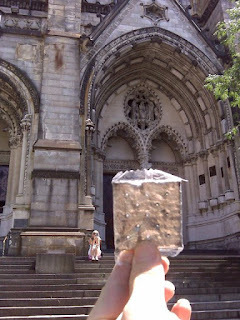 Unlike the ice cube, the cracker would vanish in a puff of pewter steam. This iron casting foundry is in Tennessee and still in operation. 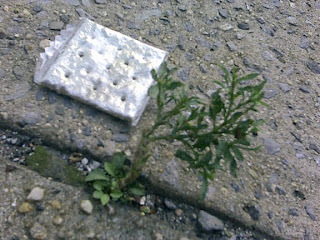 After dropping off some items at the electroplater in Brooklyn, I noticed a tree growing in the crack of the side walk. Eat your heart out, Betty Smith! This is one tough tree, just like the residents of BKLN. 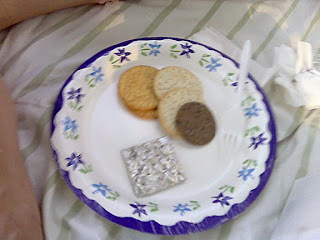 Thank you Jim Gland for the original Crack and Cracker a.k.a. 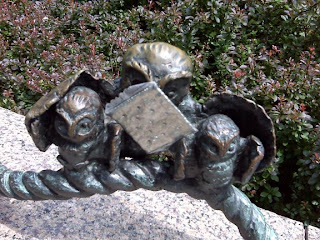 the Liberty Bell. 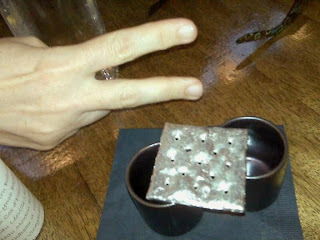 This is a good number two — I mean "Crack and Cracker II." 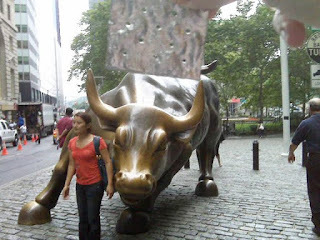 Wall street is having barbeque for this bull. Hope the bear goes to hibernate soon. Which end do you like better? I like how Elvis wrote it and Nick Lowe sang it: "What's so funny 'bout peace, love, & understanding?" 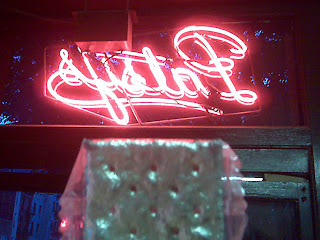 When my studio was in East Harlem (they turned it into condos) I would go to Patsy's almost every day and get a slice as a snack. They have a coal-fired oven that gives a great flavor to the pizza. It's one of 4 ovens in NYC that still run on coal. 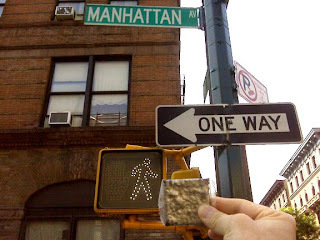 Definitely go to 118th Street and 1st Ave when you visit NYC. 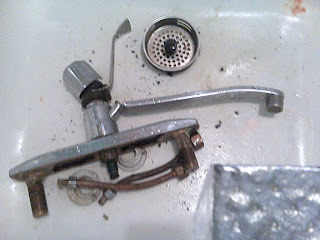 This sink wouldn't leave. It was evicted and tried to squat. 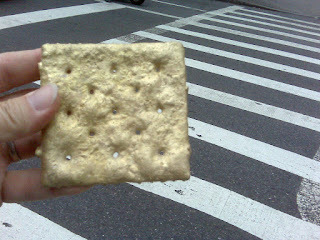 The cracker showed it the door. 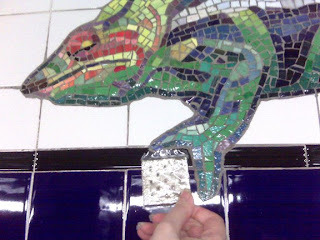 A cracker for the Frog Prince. I never want to see this light lit up while I'm in the little box on cables. Doris is a cancer survivor. 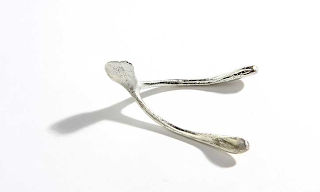 She took her pewter wishbone with her to the follow-up CAT scan for good luck. 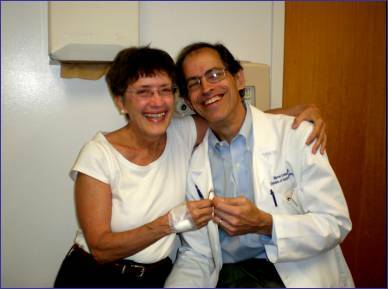 The picture shows her and her doctor, who had just given her the good news: "This picture was taken right after my doctor told me I was ok!!!!" Here's to many more cancer free years Doris. Good to have you with us. So, you must already know that great stuff comes out of Magic Hat...I'm talking about beer here people. But, I think what some folks don't realize-what they don't get to see-is that there's some pretty rad stuff that comes back to us, too. Daily I receive letters filled with adoration and experiences, thank you notes, pictures of families and pets, maps, collages, drawings, top 10 lists, stickers...someone even sent me a ring once. The coolest package of late, however, was sent to me by a man named Herbert Hoover as a thank you. 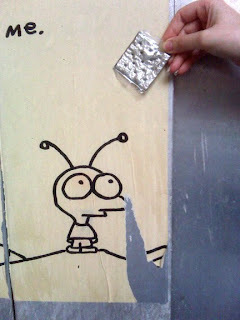 I got it in the mail today, a small white bubble-wrap mailer, black sharpie writing on the front, addressed to me. "Hey Meech, Thanks for the goodies! Best, Herb." 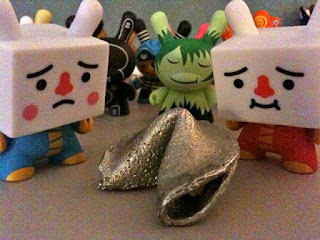 That's what the note said and along with it was a pewter cracker. 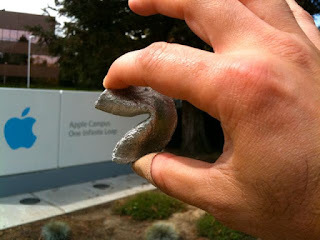 Yes, a pewter cracker. It's actually very realistic and apparently there's a huge following of Herb's work (which you can check out at herbhoover.com) and the more and more I look at it, the more I grow to like it. 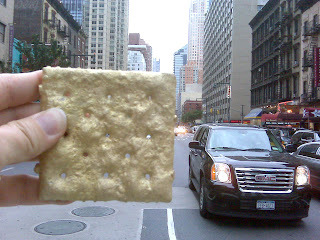 Herb and I spoke on the phone before this cracker ever entered my life and we discussed our respective names and how people either questioned our "truthiness" (to quote Colbert) or completely fumbled the pronunciation. Regardless, I thought he was nice so I sent him an extra gift with the shirt he won and this is what I received in return. Point of the story: Magic Hat fans rock. You all completely rule and show us nothing but devotion and love and, what more could we ask for? For all those folks who've taken the time to write a note, send a gift, e-mail feedback, vote in our contests, read our newsletter, come to our events, spread the word, and just think warm thoughts...THANK YOU!!!! If you have cool stuff to share, feel free to mail it to us and perhaps your goodies will be shown on our site. Momma owl puts her wings around her babies. Watch your purse. This guy has long arms and talons. 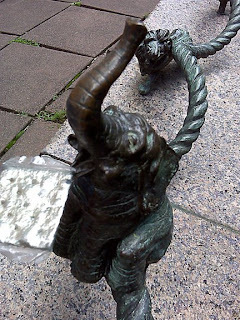 Elephants will do tricks for a saltine. 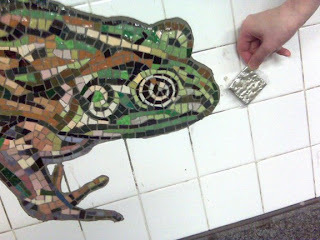 Frog in a corner at 81st Street B & C stop. 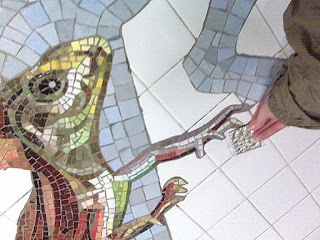 I would have loved to do our bathroom like this. This is the back side of the crab from Hell. You can see its legs. 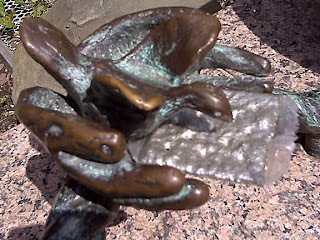 Two different versions of bird in hand at St John's.